Proposed theory imparts a biggest role to provide a great practical comparativeness on the relativity, among all the visible or invisible substances. This special relativity justifies, the existence of relativity in a different dimension, by the precise mathematical model. In 1905, Albert Einstein invented and published in his revolutionize paper about the general relativity. This was the first initiation of the modern physics, which is still ongoing towards the future. The relativity comprises an outstanding relationship among all the particles even after the quantum and nanoparticles. The space & time is relatively dependent upon themselves, this statement is the fundamental concept of relativity. One causes the effective change occurrence to another. In this paper one new concept is proposed. This theory appends one extra dimension in the relativity theory. This proposed theory consists of the space-time-height, these three dimensions concurrently. The time dilation due to the variance of these three dimensions are clearly exhibited by a set of mathematical expressions and by the help of graphs. The correlation between the time and the energy is also proposed mathematically. The incentive of this work is to briefly visualize the existing relationship among all these three dimensions in the right way. In this paper the speed of object is related to the speed of light mathematically, which exposes out the major connections among the space time height. 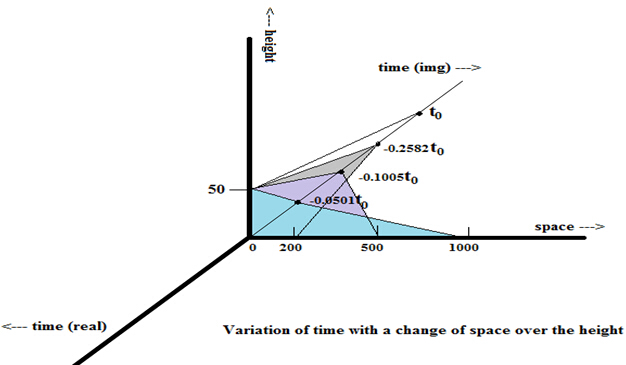 Variance of time associated with height and space of the object is theoretically visualized and comprehended in such a way that the appearance of the relativity got congenial to the readers to understand perfectly.